← Now ESNG N-mod baseboards? Once again, it’s been a long time since I posted on traction and trolleys. But I’m still thinking about modelling ideas, and while I wait, more interurbans and trolleys keep appearing on the Shapeways site. One of my issues with N-mod is that I have had difficulty thinking of designs with a 4-track main line. Why, I don’t know, as I was brought up near the SE commuter line to Orpington, all 4-track, with two fast and two slow lines. But an interurban 4-track mainline? Surely not?? In fact the Pacific Electric had two such stretches out of central Los Angeles. One was on the northern district, but over the past few months, the other one, going south into the southern district, has been of interest as a possible N-mod basis. This line is Pacific Electric’s well known 4-track expressway from LA to Watts. The Model Railroader in September 1999 had an excellent article by Tom Wetzel with a layout plan and some prototype information. I have refrained from using much of this for copyright reasons, but will probably reproduce the prototype track plans included. 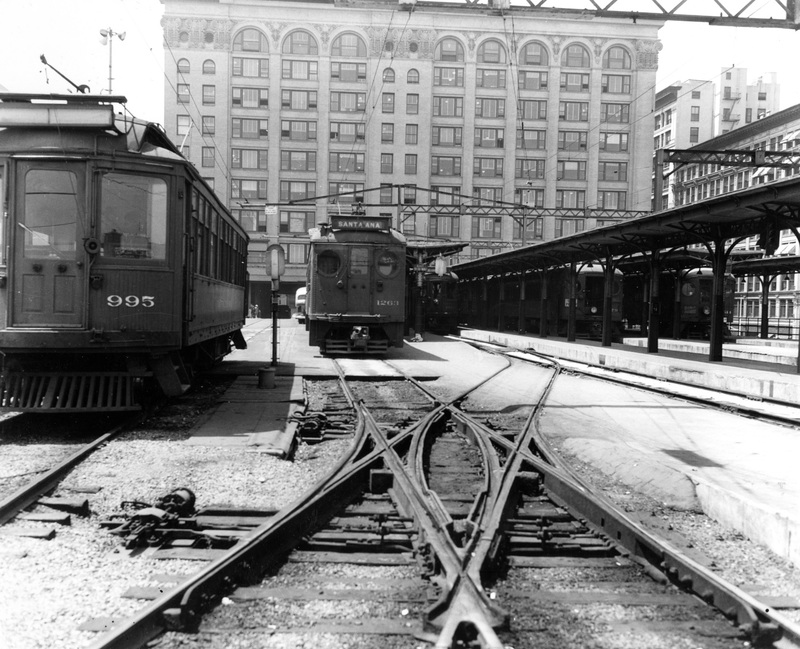 The photographs in this and subsequent posts mostly come from the fascinating Metro Transportation Library site. Travelling on this line, you would start on the elevated part of the Pacific Electric building, now converted to flats, but easily found on Google Earth. Leaving the station, trains followed a raised trestle / viaduct and then down a wood trestle ramp at 3.89% grade to street level at San Pedro Street, near 6th Street. 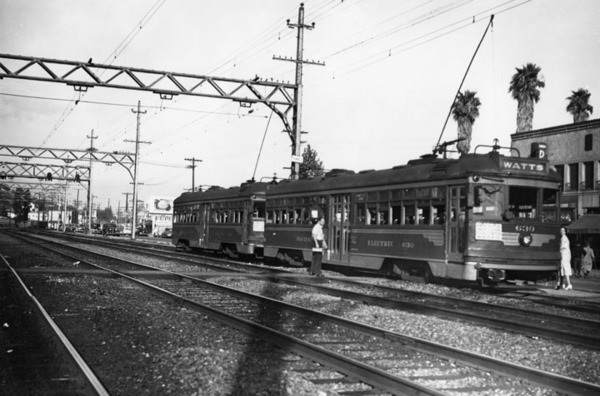 The line then ran along San Pedro Street and Olympic Boulevard to Hooper Avenue. This street track was about one mile in length. At Olympic & Hooper the line entered a private right of way paralleling Long Beach Avenue, and was joined by the yard leads from the 8th Street freight yard. This point was called “Oscar’s Junction” by PE crews after PE president Oscar Smith). 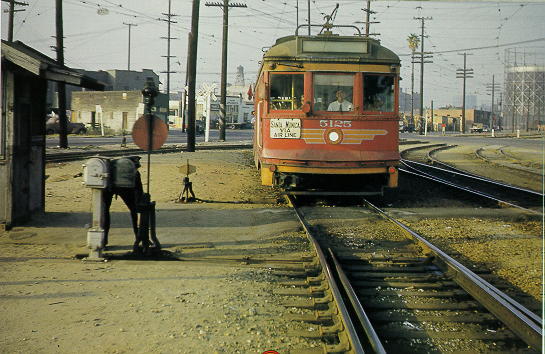 In the following photo (from “Pacific Electric in colour volume 1”) the tracks curving to the right are the yard leads to 8th Street freight yard. The line then passed a small three-track yard on the west side of the main line and headed south. 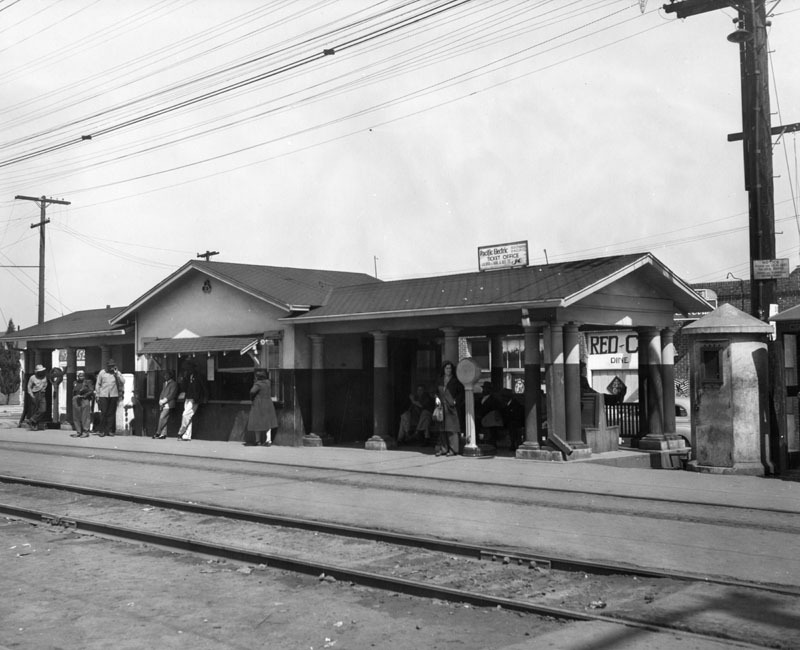 San Pedro and Long Beach passenger trains used the center “express” tracks of a four-track mainline as far as Watts — 7.45 miles from 6th & Main Streets station. The outer tracks were used by Watts local trains and freight trains. The photos below give an idea of the dead straight, N-mod like, main line – the first being early last century. Watts is often better known for the riots in 1965. The station was one of the few building in the area not burned out – and is still there, as Google Street View shows. 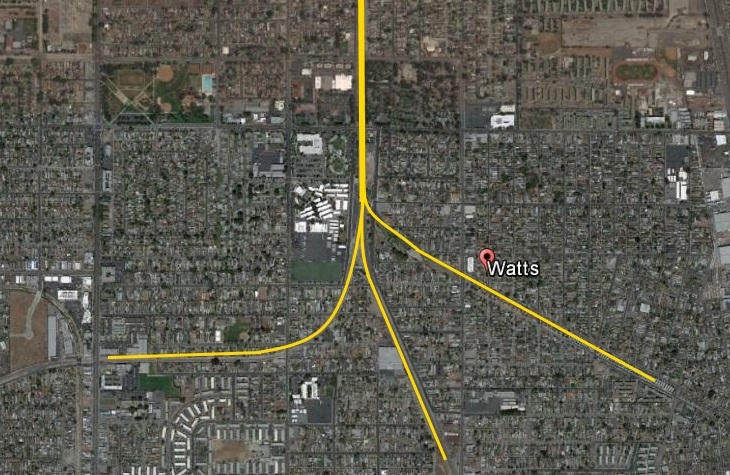 Watts recovered from that mad time, and has now evolved into a largely Latino area of LA. 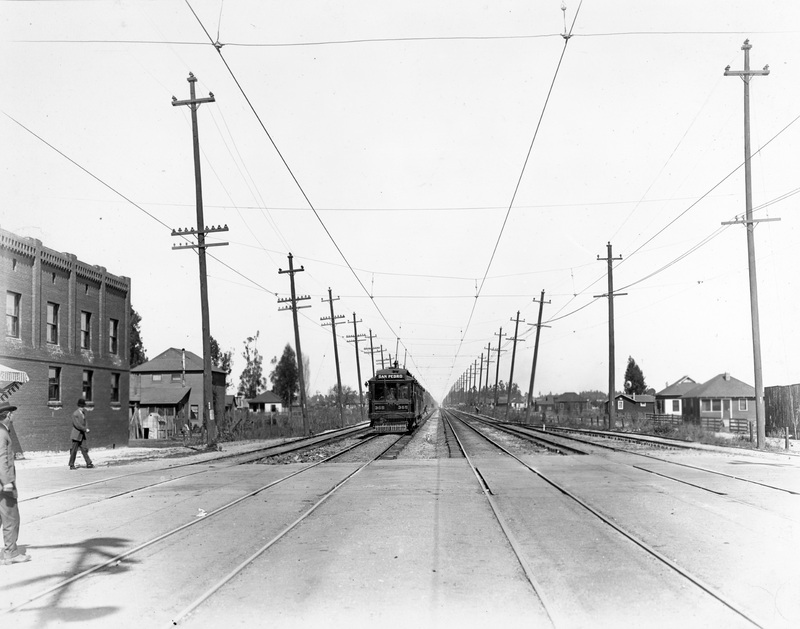 South of 103rd Street was a maze of slip switches and diverging tracks of a three-way junction. 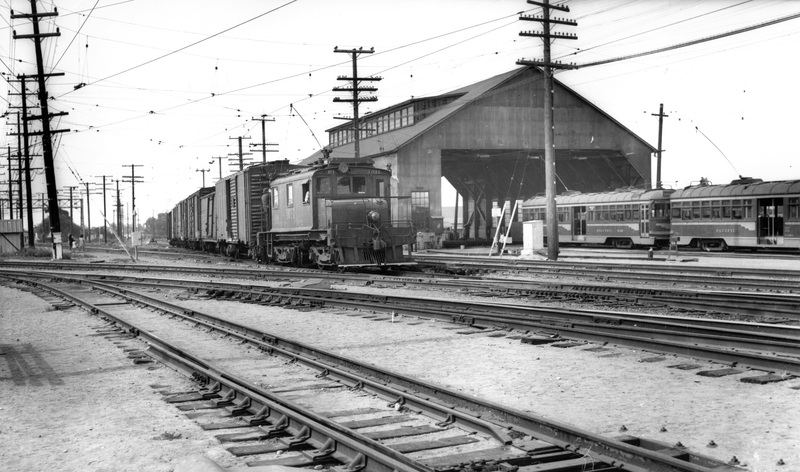 Watts included a passenger station, separate freight station, brick substation, interlocking tower, and four-track carhouse. Lines diverged here to Long Beach-San Pedro, Santa Ana and El Segundo-Torrance. 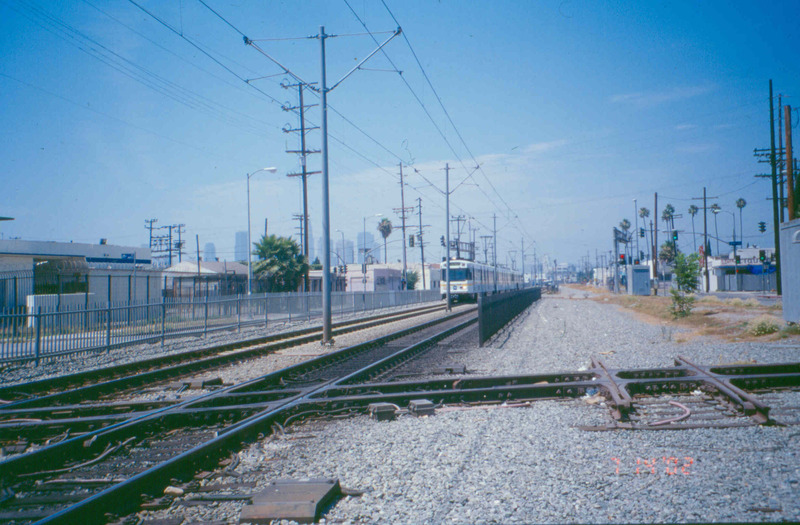 The main line from LA to Watts is still in use, reduced to double-track as part of the LA metro Blue Line. Unlike the UK, even urban areas in LA are slow to gobble up unused tracks for development, and the old track bed and the crossings and branches along it can still be identified. The old lines can still clearly be found on Google Earth – although the yards and car-house have gone. That’s enough for this post. How could we build an N-mod module of two from the Watts racetrack? Next time….